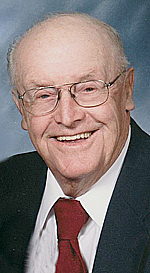 NEW ULM — LeRoy Patrick Flor Sr., age 88, of New Ulm died peacefully with his family by his side on Wednesday, June 27, 2018, at the Good Samaritan Society in Winthrop. Mass of Christian burial will be 11 a.m. on Tuesday, July 3, 2018 at the Cathedral of the Holy Trinity in New Ulm. Father Mark Steffl will celebrate the Mass, and burial will follow in the New Ulm Catholic Cemetery. Visitation will be from 4-7 p.m. on Monday, and continue from 9-11 a.m. on Tuesday at the Minnesota Valley Funeral Home-North Chapel in New Ulm. LeRoy is survived by his wife, Delores Flor of New Ulm; his son, LeRoy “Butch” (Linda) Flor Jr.; his daughters, Brenda Flor of New Ulm, Marie (Jon) Geschwind of Sleepy Eye, Renee (John) Ciralli of Great Falls, Montana; grandchildren, Alan (Amanda) Flor of New Ulm, Steven (Shan) Geschwind of Memphis, Tennessee, Adam Geschwind of Rochester, Angela (Jason) Lange of Blaine; great-grandchildren, Miley Flor, Josie Geschwind, Ella Geschwind, and Kaison Lange; and many nieces and nephews. He was preceded in death by his mother, Martha (Flor) Groebner and step-father, Frank Groebner. LeRoy Patrick Flor was born May 8, 1930, in New Ulm and raised by his mother, Martha Flor and step-father, Frank Groebner. He attended country grade school in Sigel Township, District 68. On November 25, 1952, LeRoy was united in marriage with Delores Ellig in Gaylord. The couple was blessed with three daughters and a son whom together they raised on their farm in Sigel Township. LeRoy worked his entire career as a dedicated farmer from 1952 until 1981 when he retired to New Ulm. Besides his work on the farm, there were a variety of activities that brought him great joy in life. LeRoy loved to share his musical talents for playing the concertina. LeRoy played for countless anniversaries, church celebrations, festivals, and at senior living communities over the years. For his acts of service, LeRoy was awarded with the Outstanding Senior Citizen’s award. He was inducted into the World Concertina Hall of Fame in 2016. Besides playing music, LeRoy also enjoyed dancing with Delores, cooking for his family, and playing a good game of cards with friends. LeRoy dearly loved speaking German with friends and neighbors as well. What brought him the most joy in life was his family. He especially loved spending time with his grandchildren and watching them grow. LeRoy was a devout member of the Cathedral of the Holy Trinity in New Ulm and also a member of the St. Joseph/St. Elizabeth Catholic United. LeRoy will be dearly missed by all who knew and loved him. Blessed be his memory. In tribute to LeRoy, the family will provide LeRoy’s concertina at his visitation for anyone who would like to play a song or two for visitors.